What makes Ghisallo such a special climb is the gorgeous view of Lake Como and the famous church on the summit. A church dedicated to cyclists, where an eternal flame burns for those no longer with us. Next to the church is the cycling museum, with a large section on the history of the Giro, and exhibits charting the technological evolution of the bicycle. 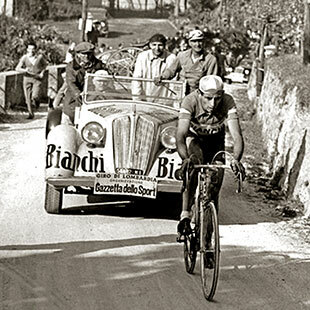 Ghisallo’s ties to cycling have a history that is long, compelling and passionate, and bear witness to thrilling challenges from the Giro di Lombardia to the Giro d’Italia. Ghisallo Pass is located at an altitude of 754 metres. We recommend the Bellagio face, with a climb of about 10 kilometres, but the ascent won’t seem as lovely as the message etched in the stone situated in the central room of the museum: “Omnia Vincit Amor”, love conquers all. Interested in this challenge? Share it with your bike friends! Your request will be sent to n. 2 hotels.